I wouldn't worry about the exact version when the feature was added. either natively or by a USB converter. So if you want to pick one up for rotation, I'd say go for it. the front panel settings when the unit is on standby (power switch on back is on, but power on front is off). The front panel LCD tells you what settings you're adjusting. According to the changelog, version 1.200.011 is when they added the rotate function, v1.200.010 and below don't have it. There's another one on eBay, firmware version 1.200.12 and he checked the geometry section for me--no sign of "rotate". What's going on? It's an IA and not an OptiScale? Which versions are the FPGA and HD FPGA? functioning (in Version 1.200.012 only) has been corrected. does anyone know where a list of console games with a tate mode would be? Does that make this the first home PC port with a tate mode? and one of the following would be the first console game with tate mode? Does it appear like this unit could be updated to add rotation? it certainly does. All units except for the blue Optiplex ones should be updateable. Just to give my 2 cents : I've been playing with my IA today, trying the rotation with scanlines for the first time, and... it's not so bad to be honest. I expected much worse. The output of my IA is stuck in 720p at the moment (left/right buttons on the front pannel stopped working). I need to fix this & check if it would get better in other resolutions. Did a quick hookup to verify that the rotation option works....and yes it does. Bad news is since my supergun has scart output and the PGM has been know to output a strange sink I get a rolling picture with my scart to component transcoder. Hope to do some troubleshooting this weekend. If I get it working I then have to buy some tate boards. I'll start with beestorm since it's a cart for the PGM...even though it's looked down upon from the "tate elite". Update...got my synch issues worked out and it's working great. Does anyone have the firmware's available and could upload them somewhere? thanks! i have a pair of Cyber Lead cabs and a couple of boards that are vert. In theory, would one of these allow me to use a vert based board in my cabs? I seem to have missed the boat on these and can't find any for sale anywhere right now. it only makes sense if you have a display that can do at least 720p. these are cheaper than ever, hardly more than $80 these past months. Yeah, the prices have been good, but all of the ones for sale are gone. I take it that these show up fairly often? What about displays that don't go up to 720p? Yeah, the prices have been good, but all of the ones for sale are gone. I take it that these show up fairly often? not worth it. After the initial line doubling step you have a 640x480p or 720x480p image. To display this vertically you need 1280x720p. ugh. all i wanted was to use some verts on my horizontal cab. back to the drawing board i guess. Hi, I've just bought a SOIA but unlucky it doesn't have the power supply. Someone knows the right voltage or the size of power connector (maybe post a link from Ebay, Amazon or any other electronic sellers)? Another question, I'd like to use with a sony BVM A20F1M, mainly to tate Saturn and Ps1 shmups via a Sync Strike, does it output 240p (or does it only upscales resolution)? Thanks in advance and sorry for my rusted english. it has an integrated PSU, so you just need a power cable (standard 3-pin). Thank you very much for the quick reply Fudoh! 1)I've bought a Xpc-4 mainly for the x68000, but now I'd like to use for other retroconsole. First which hd tv do you think is better: my kuro lx5090h (pro: dimensions, colours, cons: input lag) or my kdl 42 w653a (pro: input lag cons: dimensions, colours). 2)My "ideal" chain will be Saturn, Ps1, Neo Geo CD, Pc engine CD-> Joytech AV Control Center -> Sync Strike-> a VGA switch with two other input to connect DC and x68000 (so I need one with three vga inputs free)-> SOIA -> TV. Is better to use two separate outputs of the Xpc-4 (one for normal gameplay, other for tate gaming)? First which hd tv do you think is better: my kuro lx5090h (pro: dimensions, colours, cons: input lag) or my kdl 42 w653a (pro: input lag cons: dimensions, colours). My "ideal" chain will be Saturn, Ps1, Neo Geo CD, Pc engine CD-> Joytech AV Control Center -> Sync Strike-> a VGA switch with two other input to connect DC and x68000 (so I need one with three vga inputs free)-> SOIA -> TV. if I remember right, the SOIA does not process 15khz RGBs. Thank you, I will probably use the xpc-4 via hdmi only on the Sony since I love arcade style actions, run and guns and shoot 'em ups. I'd like to buy this soundbase https://www.cnet.com/products/sony-ht-xt1/review/ to improve a little sound and add three hdmi ports, do you think it will add lag on the 3 hdmi input on the soundbase? How can i connect 15 khz sources (Saturn, Sigma Supergun, Ps1, etc...) to Optix Anyplace inputs? Is a Synch Strike via VGA enough? Because I need to know exactly what I have to buy. I chain a supergun RGB out through XRGB-1 and into the SOIA. Next, I have the SLG 3000. Finally, the Extron RGB 118 and my monitor. It's really up to you. You probably need a line doubler with RGBHV 480p 31kHz out. You only need an Extron if you have an exotic PVM. Also, the RGB 118's 9 pin universal input has always been a pain in my rear. So can you confirm that the SOYA wouldn't accept any 240p - 15 khz source (so I have to use the XPC to upscale and then connect it to the SOYA)? Has someone tried to connect 480i component ps2? How does it deinterlace the image (better or worst than a framemeister or dvdo edge)? just read my review. 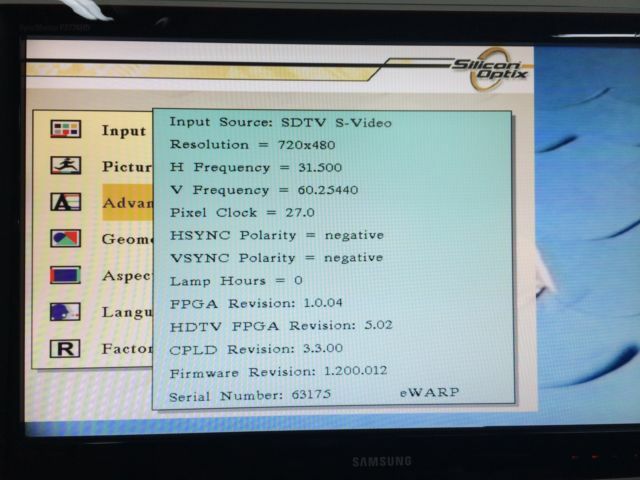 Of course the SOIA accepts 15khz signals, both 240p and 480i, just not in RGBs format. If you want the SOIA to do the linedoubling (which it does rather nicely due to it's FLI2200 Faroudja design), you need a Scart to YUV transcoder. Those small boxes people in the US use to connect Scart RGB sources to their YUV-only CRTs. considerably better than a DVDO Edge, but not quite as sharp as a FM. Thanks Fudoh, I will connect my ps2 to the component output of the SOIA as soon as I will received it. Thanks a lot for your help and please understand that I'm not skilled as I'd like to be in this area. 1) Maybe it's a stupid question but If I use (example) SATURN (SCART RGB OUT)-> SYNC STRIKE-> XPC-4-> SOIA (VGA INPUT) does it works even if I not convert into component? 2) Or is it better to go this route SATURN (SCART RGB OUT)-> SMALL BOX TO CONVERT SCART TO YUV -> SOIA (COMPONENT INPUT) to avoid lag? 3) Is this http://www.ebay.com/itm/221102930392 one of the small boxes you wrote about? 4) How many component inputs does it have the SOIA? From the pictures I will say two but I'm not sure. If you linedouble using the XPC first, then you don't have to worry about going component. lag should be about the same. The SOIA should be faster using a 31khz source signal, but then again you add a little lag from the XPC. you have two sets of BNC inputs, but I don't remember if these are auto sensing or if one just takes SD and the other ED and HD.